Gorse Hill Nature Reserve is a rich, diverse habitat for wildlife, which was set up by the Northwest Ecological Trust. The reserve commands panoramic views across the West Lancashire Plain to Liverpool, from North Wales to The Lake District and to Pendle and Winter Hills in the east. Developed from former agricultural land in 1996, the 85 acre site now supports a range of varied habitats, from mixed native woodlands and hedgerows, wildflower meadows, heathland, ponds, wetland and reed beds. From an open ecological desert the developing habitats now support a wide range of wildlife. Run entirely by volunteers, Jonathan Atkins, Reserve Manager, will take you on a guided tour of the reserve, and introduce you to some of the wildlife that now calls Gorse Hill home. 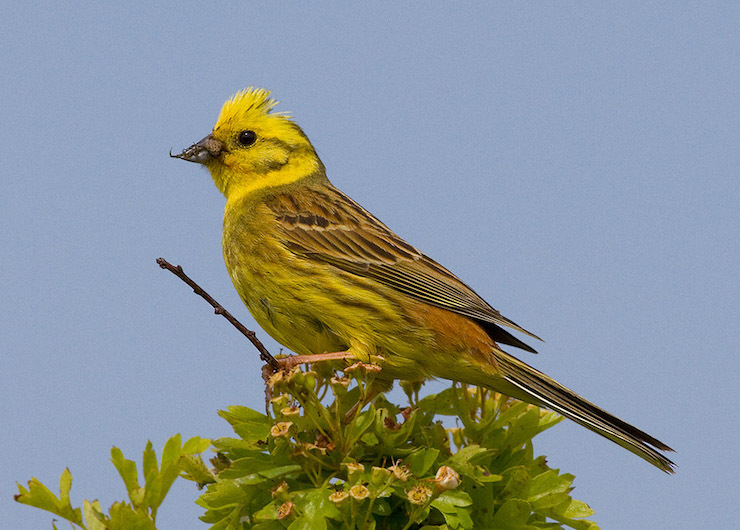 The photograph, taken at Gorse Hill Nature Reserve by Mark Walters, is of a Yellowhammer. Visitors are very welcome and the cost is £4, which includes light refreshments.